For family movie night this evening, I curled up with Rache and the boys and popped a Blu-Ray into the PS3. It was, finally and after failing to hit it in the theaters, Alice in Wonderland. But I found it troubling. Not badly made, not at all. But troubling, because it speaks to the deep difference between the culture in which Lewis Carroll wrote and the culture into which that tale has been reimagined. The whimsy of the Carroll tales, their faerie madness, well, that was only subtext. The story we were shown...seemingly the only kind of story we know how to tell...was utterly familiar. It was one of war. There are, of course, strong intimations of violence in the original Wonderland tales. Wonderland is a place where things are not as they seem, and it's not without its dangers. But not nearly enough for our blood-hungry palates. Here, swords and revenge and war drums and noble heroes with vorpal swords bringing justice are front and center. If there is not conflict, not battle, no witty quips uttered as a blade brings an end to a foe, well, honestly, we'd be bored witless. We want to see the Mad Hatter pouring out hot cups of whupass. 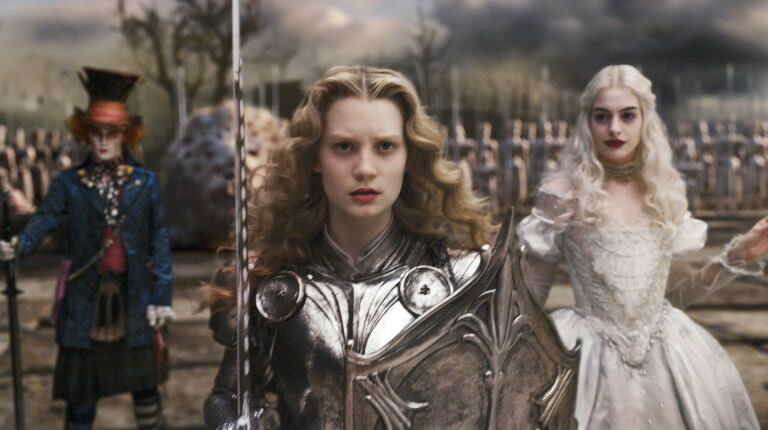 We want Alice the Warrior. It's the Alice we want to see, so that's the Alice we get. I suppose, given our culture, I should be grateful she didn't slay the Jabberwock whilst wearing booty shorts and a tube top. Maybe in the sequel. It's clear, through this telling, that we no longer have ears to hear about Wonderland. We'd much rather hear stories of Underland.